If you're a frequent JustJulie reader then you'll know that I have extremely dry hair, it was very damaged two years ago and I've since been on the never ending hunt to find that one product that will give my hair that much needed moisture boost. A month ago I popped into my local Lush store and picked up the Retread hair conditioner, would this be the answer to my prayers? Aside from Lush face masks and obviously their bath products, I've never really tried any of their other products, so I popped into my local Lush branch in Bluewater Shopping Centre and thought I'd pick the sales assistants brain and see what their hair treatments were like. It was between this and another treatment but in the end I opted for Retread as it seemed to tick all the boxes. My hair is extremely dry, it's been over processed throughout the years, although the condition and thickness of my hair has changed dramatically over the past two years, I still have dry hair. It never gets greasy, I could leave it a week and there would still be no grease, to some that may sound like heaven, but to me it's not. I want a conditioner that is going to give my hair a huge moisture boost, leave it feeling silky and soft for days and help strengthen it too. Lush Retread promises to mend the outer shaft of the cuticle by coating the hair with lots of natural oils and ingredients like agar agar gel, jojoba oil, avocado oil, virgin olive oil, which helps to add shine and moisturise your hair. Retread also has yoghurt and soya milk which adds protein to the hair, which will help strengthen hair. Sounds amazing right? This is classed as a heavy weight conditioner, and that it is. I applied way too much the first time I used this and wasn't too keen on it, but the next time I washed my hair I used a smaller amount and my hair felt amazing afterwards! I tend to leave my conditioners on for around 30 minutes whilst I'm in the bath, the longer it's on and add the heat and steam from the bathroom, this will allow the conditioner to penetrate deeper. I've used this 5 times now and I bloody love this! My hair instantly feels full of moisture. The shine that is often rare on bleach blonde hair is actually obvious after using the Retread! My hair feels silky and soft and has this amazing bounce to it and after every use my hair is starting to feel much stronger. My hair is no longer feeling dry and has actually begun to get a little greasy after four days, which is a huge improvement for me, as normally after a week of not washing it, my hair still feels as dry as a bone! So I take the sign of a little grease that this is actually really starting to work on my hair! I can't recommend this enough! I have used a lot of deep conditioners that I love but none of them have made a difference this quick, also most of them tend to cost £20+ which is a little steep. So if you suffer with dry hair, have damaged your hair or need the extra boost then I would go pick a tub of this up! I'm attending a Lush event next week, so I'll picking up another tub as a spare! 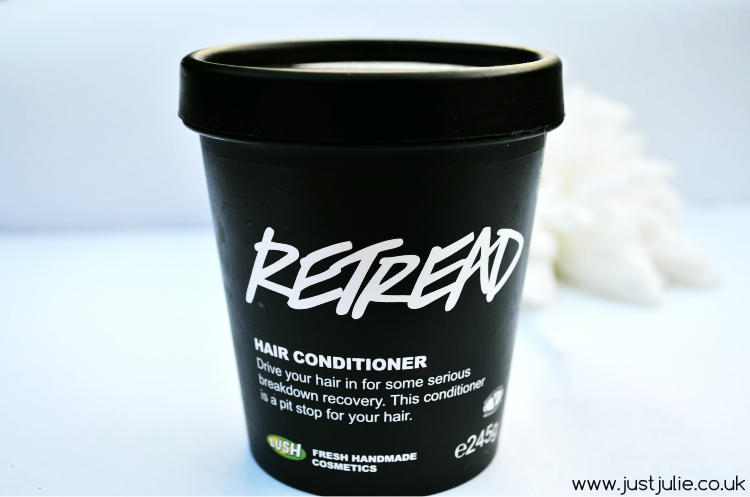 Have you tried Lush Retread before? What is your favourite deep conditioning treatment?